Palmer, who died Sunday in Pittsburgh at age 87, was the accessible common man who would become the King and lead his own army. Along the way he became one of the sport's best players and a successful businessman, philanthropist, trailblazing advertising spokesman, talented golf course designer and experienced aviator. 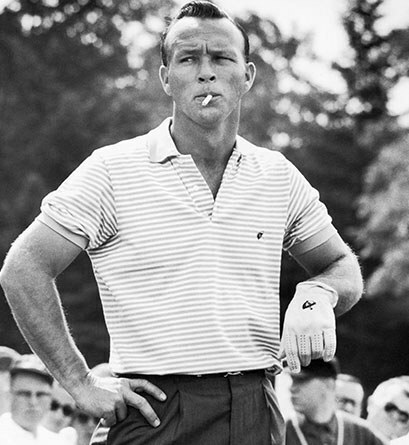 "We are deeply saddened by the death of Arnold Palmer, golf's greatest ambassador, at age 87," the U.S. Golf Association said in a statement. "Arnold Palmer will always be a champion, in every sense of the word. He inspired generations to love golf by sharing his competitive spirit, displaying sportsmanship, caring for golfers and golf fans, and serving as a lifelong ambassador for the sport. Our stories of him not only fill the pages of golf’s history books and the walls of the museum, but also our own personal golf memories. The game is indeed better because of him, and in so many ways, will never be the same." Palmer, part of the alluring "Big Three," with Jack Nicklaus and Gary Player, won 62 titles on the PGA Tour, his last coming in the 1973 Bob Hope Desert Classic. Among those victories were four at the Masters, two at the British Open and one at the U.S. Open. He finished second in the U.S. Open four times, was runner-up three times in the PGA Championship, the only major that eluded him, and was inducted into the World Golf Hall of Fame in 1974. "Arnold meant everything to golf. Are you kidding me?" Tiger Woods said . "I mean, without his charisma, without his personality in conjunction with TV — it was just the perfect symbiotic growth. You finally had someone who had this charisma, and they're capturing it on TV for the very first time. "Everyone got hooked to the game of golf via TV because of Arnold." 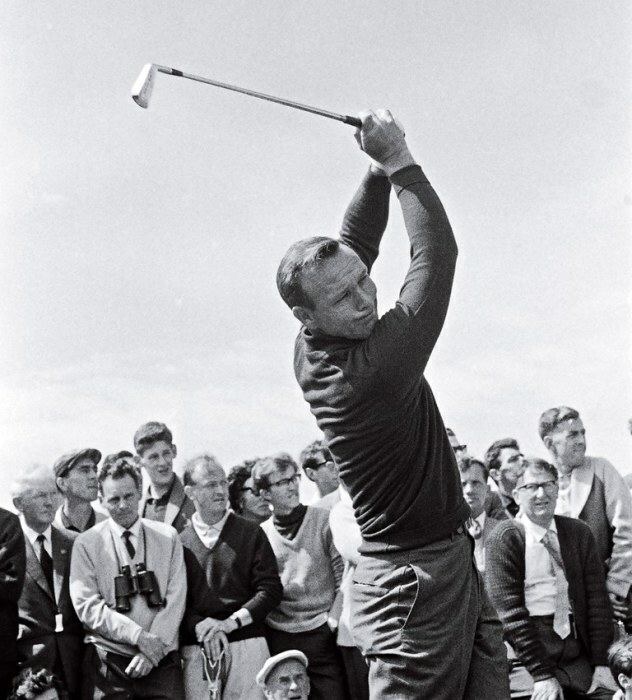 He received virtually every national award in golf and was the "Athlete of the Decade" for the 1960s in a national Associated Press poll. 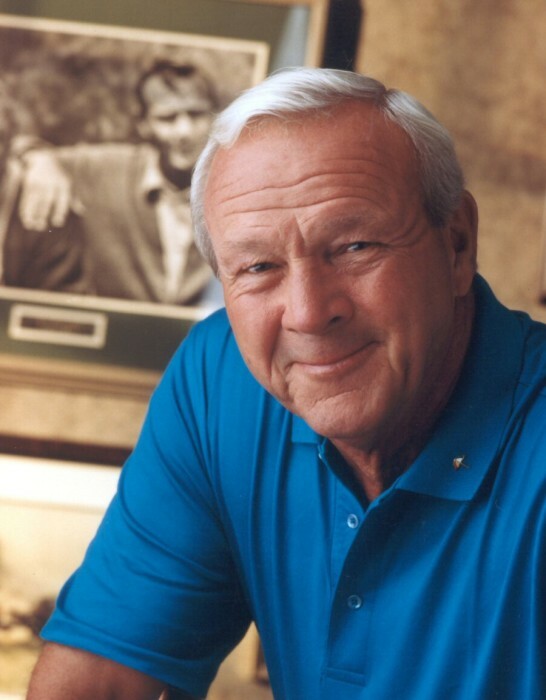 Palmer, who helped found the Golf Channel decades later, also helped usher in the Champions Tour, where he won 10 times, including five majors. Dwight Eisenhower, who loved golf, was one of Palmer's best friends. Richard Nixon asked Palmer about the Vietnam War. Palmer played golf with both Presidents Bush. Eisenhower painted Palmer's picture — as did Norman Rockwell. There is a drink named in Palmer's honor, as well as an airport, a golf tournament, hospitals, streets, charity initiatives and 19th-hole grill rooms. "There are two things that made golf appealing to the average man — Arnold Palmer and the invention of the mulligan," actor/comedian and good friend Bob Hope once said. His greatest stretch of golf began in 1960 and lasted four years, with Palmer winning six major championships and 29 titles on the PGA Tour. It was in 1960, at the Masters in Augusta, Ga., that a local newspaper coined the phrase "Arnie's Army," when soldiers from nearby Camp Gordon followed Palmer. Soon, non-uniformed fans across the land enlisted. Palmer's defining moment, one that embedded the word "charge" into the minds of his adoring fans, came in the 1960 U.S. Open at Cherry Hills. Palmer had won the Masters two months earlier, with birdies on the final two holes to edge Ken Venturi by one shot. But Palmer began the final round of the Open seven strokes and 14 players behind and was told by Bob Drum of The Pittsburgh Press that he was too far behind to win. A month later, Palmer made a pilgrimage to St. Andrews for the British Open, and his presence helped salvage the game's oldest championship and elevated it back among the game's best tournaments. "Arnold was the epitome of a superstar," fellow Hall of Famer Raymond Floyd said. "He set the standard for how superstars in every sport ought to be, in the way he has always signed autographs, in the way he has always made time for everyone. On the golf course, all I ever saw was a mass of people. He was able to focus in on everyone in the gallery individually. It wasn't fake. "And man, could he play the game." But as dramatic as his victories were, so, too, were Palmer's losses in majors. But the masses never deserted him. Palmer's appeal was so large, so wide that he even gave origin to a beverage that soon became a hit across the land. One of his favorite drinks was a mixture of iced tea and lemonade. "A guy came up to the bar, and he ordered an Arnold Palmer, and the barman knew what that drink was," three-time major champion Padraig Harrington recalled about a visit to an Indian restaurant in Orlando in 2009. "Now that's getting to another level. Think about it, you don't go up there and order a Tiger Woods at the bar. "When the guy ordered it, I thought, maybe you could do it in a golf club, but he's ordered it in a random bar. And the guy, who probably wouldn't know one end of a club from the other, knew what it was." Palmer's accomplishments were wide spread, his influence wide ranging. He helped raised hundreds of millions more for charities. In 2002, Arnie's Army Battles Prostate Cancer was launched and more than 2,500 tournaments across the country sponsored by the organization have raised more than $3 million for prostate cancer research. "The game has given so much to Arnold Palmer," Nicklaus said, "but he has given back so much more." "Arnold, you've struck our hearts and our minds, and today your government, your fellow citizens are going to strike a gold medal for you." Added Senate Majority Leader Harry Reid: "Golf made you famous, but your tireless efforts to save lives, not your short game, will make you immortal."